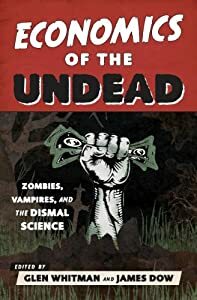 My chapter in The Economics of the Undead focuses on the ways in which political ignorance undermines efforts to combat zombies and vampires. From Dracula to Buffy the Vampire Slayer to World War Z, a constant theme of books and movies about the undead is that public ignorance and irrationality exacerbate the danger they pose to humans. Typically, the story begins with a growing undead menace that the ignorant public is largely unaware of. As a result, government does little or nothing to address the problem. When the threat becomes so obvious that voters finally become aware of it, the reaction is an irrational panic that often leads to perverse policies that make the problem worse. In addition, the government and various interest groups often take advantage of the public’s ignorance and bias to use the crisis created by the undead for their own benefit. Nefarious government officials try to coopt the undead to advance their own agendas. Special interests exploit the situation by claiming that the best way to fight the undead is to give them more privileges or increased government funding. The ignorance and irrationality highlighted in stories about the undead is an exaggerated version of the real-world problem of voter ignorance. Because the payoff to acquiring political knowledge is so low, voters are both rationally ignorant about politics, and do a poor job of evaluating the information they do know. Public ignorance impacts real-world disasters just as much as zombie uprisings. For example, ignorant voters reward governments far more for disaster relief spending than for disaster prevention, even though the latter is much more effective in saving lives. Relief spending is far more visible to poorly informed voters than prevention spending. After a disaster happens, the media constantly covers relief efforts. Voters watch because the coverage is dramatic and entertaining. By contrast, few voters keep track of disaster prevention spending, or even know about it. As a result, governments often fail to properly prepare for and mitigate disasters in advance, and then engage in wasteful but showy spending in the aftermath. Political scientist Daniel Drezner, author of Theories of International Politics and Zombies, points out that the kind of public ignorance we find in zombie stories is now affecting efforts to deal with Ebola. As in the case of the undead, the response to Ebola was slow at first because most voters were ignorant of the very existence of the problem. When they finally found out about it, public reactions to Ebola were heavily influenced by ignorance and illogical thinking. Both right and left-wing activists and politicians took advantage of the situation to promote agendas with little or no real connection to the problem. The left is using Ebola to trumpet increased funding for government agencies like the CDC and the NIH, while the right uses it to justify restricting immigration and travel, even though neither approach is likely to do much to actually solve the problem. Fortunately, at least for wealthy Western nations, the Ebola crisis is probably only a very minor danger. The average American is far more likely to die by drowning in their bathtub than by catching Ebola. If political ignorance undercuts effective responses to Ebola, the result won’t be anywhere near as bad as a zombie apocalypse. Nonetheless, public ignorance could easily make Ebola policy more wasteful and inefficient than it needs to be, and might potentially result in at least a few avoidable deaths. And if Western governments react to ill-informed public anger by banning travel to and from affected nations instead of focusing on more effective and less draconian measures such as temporary quarantines, the result will be extensive needless suffering and a longterm exacerbation of disease risk. Too often, well-intentioned but ignorant humans are more deadly than even the most malevolent vampires and zombies. Ilya Somin is a law professor at George Mason University School of Law, and author of Democracy and Political Ignorance: Why Smaller Government is Smarter (Stanford University Press, 2013). He is a regular contributor to the Volokh Conspiracy blog, affiliated with the Washington Post. This entry was posted on Friday, October 31st, 2014 at 11:45 am	and posted in Uncategorized. You can follow any responses to this entry through the RSS 2.0 feed.